Batten down the hatches and roll out! Buildable 8-wheeled UNSC Kodiak Siege Cannon artillery vehicle. Features a camo finish, opening compartments, deployable lockdown system, and pivoting cannon! Includes 3 detailed, poseable action figures: Spartan Alice-130 and two Brute Minors. 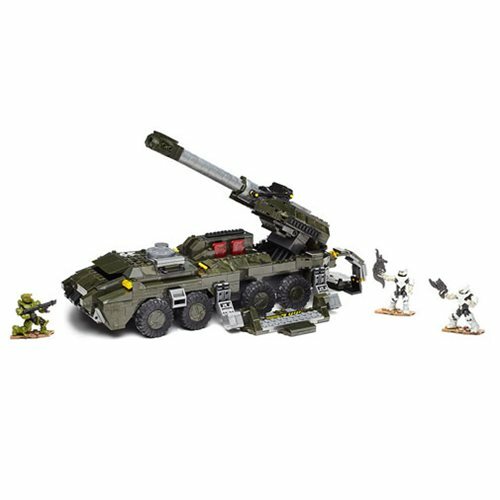 Batten down the hatches and roll out with Spartan Alice-130 in the Mega Bloks Halo UNSC Kodiak Siege Cannon! Rigged with ironclad defenses, this buildable 8-wheeled artillery vehicle comes fully loaded with a massive pivoting cannon. Build the Kodiak, and brace your Spartan for an attack from the approaching Covenant Brutes. Then deploy the Kodiak's lockdown system, and bombard behind enemy lines. The highly detailed, super-poseable Spartan Alice-130 and 2 Covenant Brute Minors micro action figures each come with their own detachable armor and authentic weapons and accessories. The Kodiak Siege Cannon features a camo finish, opening compartments, deployable lockdown system, and pivoting cannon. Combine with other Halo Mega Bloks sets (sold separately) to build your own authentic Halo universe!